Exclusion lists are very useful advanced tools for your targeting your campaign. 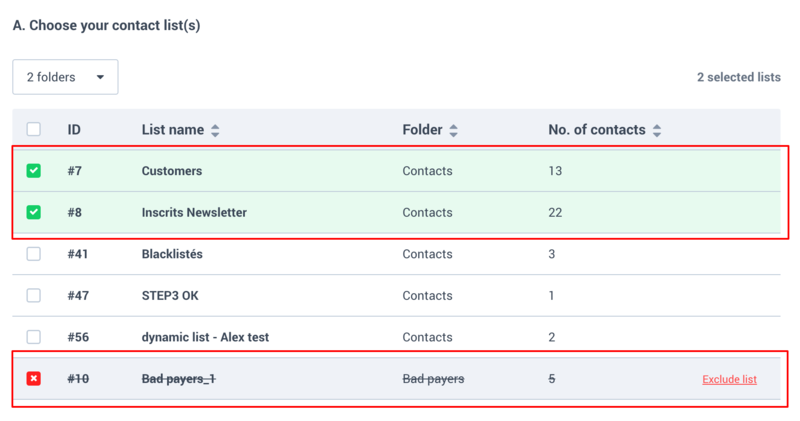 When you choose your contact lists to exclude, in the Recipients step of your campaign creation, you can also choose the subscribers that you do not want to receive your campaign. Even if these subscribers are present in the recipient lists, the email will not be sent to them. To create an exclusion list, hover your mouse over the List(s) that you do not want to receive your campaign, then click on Exclude list next to each list. Here, the campaign will be sent to both contact lists: the Customers & Newsletter subscribers, with the exception of Bad payers. Have a question? Please email our customer care team at contact@sendinblue.com.